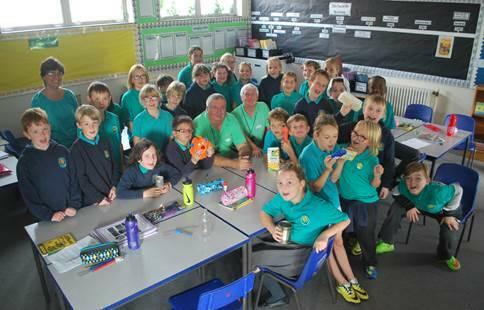 Pencoed Primary School is keen to be green! Did you know that plastic bottles take 450 years to decompose if thrown in the bin for landfill? Or that aluminium cans take 80 years to degrade? Or that glass and foam won’t rot? Children from Pencoed Primary School have been learning these and other facts about recycling at a special workshop. The school currently has three Green Flags from Keep Wales Tidy in recognition of their efforts to be as ‘green’ and eco-friendly as possible, and a class of year five pupils tested their knowledge of all things recycling in a fun quiz. The workshop was delivered by ADA Training in partnership with the Labour run Bridgend County Borough Council and is part of a series of sessions that are spreading the ‘reduce, re-use, recycle’ message in local primary schools this term. Cllr Phil White, Cabinet Member for Communities said: “Whatever your age, it is really interesting to hear just how long it takes for items to break down if they are thrown out for landfill. It shows us all just how important it is to recycle these materials rather than throw them away.